Cucoloris, cukes, or cookies, are not those delicious chocolate chip things, they’re actually these funky, patterned pieces of equipment that you can use to get some really interesting or dramatic lighting effects. You simply put one of these in front of your light and the patterns show up on the background or wherever your light is facing. Now, for most of us, three point lighting, or standard interview lighting is one of the most, if not the only, way we light things - especially when starting out or when we’re new to the industry - it’s safe and typically a very effective way to light. But, we have the ability to control, shape, and modify lights AND shadows to an enormous extent, and as filmmakers, or creative professionals, we should try and do this every chance we get. And one of the easiest ways to creatively or dramatically modify lights, is with cookies. Cookies, or as I mentioned earlier, cuc0loris, or cukes as they are regularly called, can be really anything that shapes the light into a pattern - from window blinds to tree branches to spooky arms on a wall, and everything in between. Honestly there’s no right or wrong shapes - these can be whatever you want. Now you can pick up really nice wooden versions of these online for like $80+ - but today we’re going to make a set of our own, for less than $12. Materials you’ll need are two pieces of large black foam board, and you can pick these up at your local hobby or craft store - these 20”x30” ones are like $6 at the Hobby Lobby here in town, and be sure to get the foam board and not just thick construction or card stock paper - we want these to be stiff (that’s what she said). 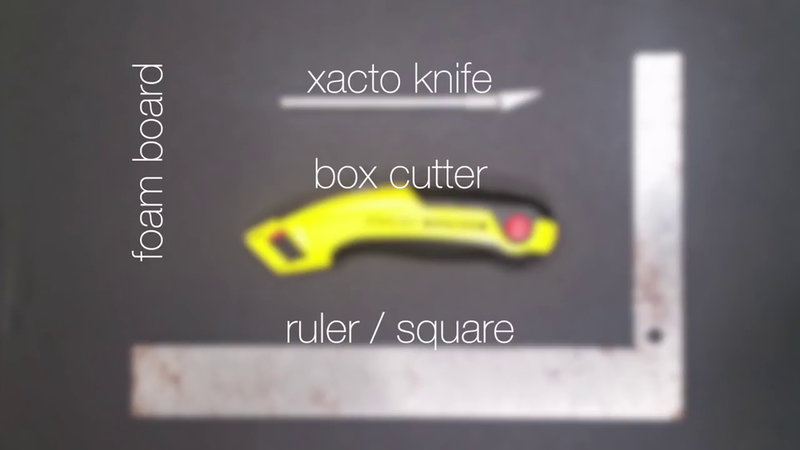 And then you’ll need a ruler or a carpenters square to make the straight lines, and then a box cutter or an exacto knife. First thing you want to do is cut this shape down into smaller portions - so they’re easier to transport - I cut my 20x30 inch pieces in half to make two 20x15 inch pieces - if you have a 24x36 inch piece just cut that down into two 18x24 inch pieces. Something to keep in mind when cutting is we’re going to be clamping these down by the edges, so you’ll probably want one to two inches of space around the outside of these for your clamps to grab onto - any smaller margins than that and we risk covering our shapes up with the clamp. So the most basic style of cucoloris you’ll find is the one with the nebulous blob-like shapes all over. 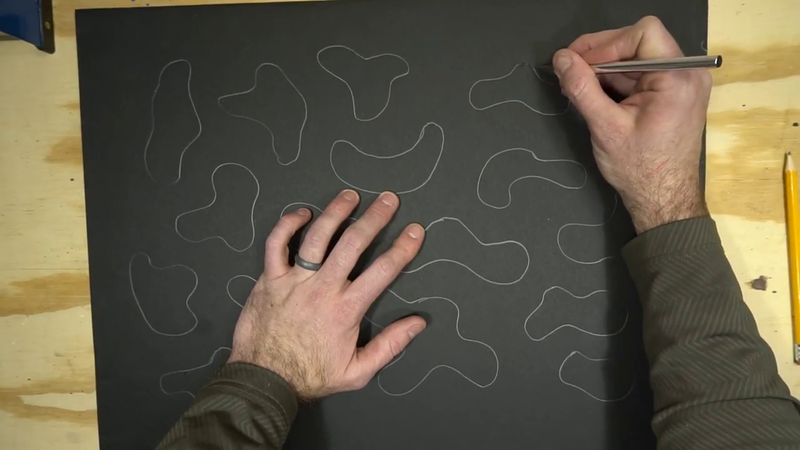 To make this you’ll want to sketch some shapes out on your foam board - and then simply cut them out with your knife. Go slow, and be sure you’re making nice, clean cuts on all these edges. And boom, first cucoloris is done. Now one that looks like a standard four pane window is also pretty common. To make this one we’ll want to cut a few rectangles, but first let’s frame the edges up - I gave myself a 1 ½ inch wide margin - Then measure and mark halfway down each side so we know where to put the crossbar thingies - I made these 1 inch wide. Once you’ve got everything marked go ahead and cut them out - after you’ve got the panels cut out be sure to go in and clean up any sloppy cuts or rough edges. And boom, second one done. And the last one we’ll make is a mini-blinds one - this one is pretty popular too, and one of my personal favorites. So frame up the edges like we did with the 4 pane one, and then mark out the blinds - I made mine 1 inch thick. Then just cut them out - I had an uneven number of blinds on the one I did, so I just left one side uncut which will actually leave a nice large space to clamp onto. So, you’ve just created your own set of cookies - but how do you use them? Like I said earlier it’s as simple as putting one in front of a light and just going from there. But, like with most things, there are some nuances and tricks that can really make these pop. So let’s get into a few tips to make these even better. Tip 1: Make sure you control your shadows. When you first set up your cookies with a light one of the issues you might notice right away is that there is some spill on the outside of the window - now real windows don’t do this so we want to either flag off the excess light, use some blackwrap, or close the barn doors a little. Tip 2: You don’t need anything special to just use these, a stand and a spring clamp works just fine, but consider getting a duckbill clamp or maybe even a grip arm and grip head to attach these too - you’ll find eventually that having the extra range of motion that these gives you is a huge help when trying to create the look you want. Tip 3: Modify the light coming through. Adjusting the angle of the light and adding in gels can really help sell the illusion that it’s a different time of day or night. By adding in an orange gel you can go from a midday to an early morning or late evening look, and adding in a blue gel can help sell a nighttime or moonlight sort of effect.